Monday Morning Story Time is back! 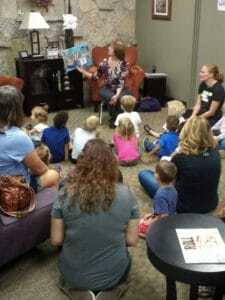 After our regularly scheduled break in August, we had our first Fall Story Time on Monday, September 10th and we were so excited to see so many new families with us. If you are new to Rose Hill and have a child infant to Preschool age we invite you to join us for Story Time every Monday at 10:00 AM. This is a great place for you and your child to meet new friends! We hope to see you soon! 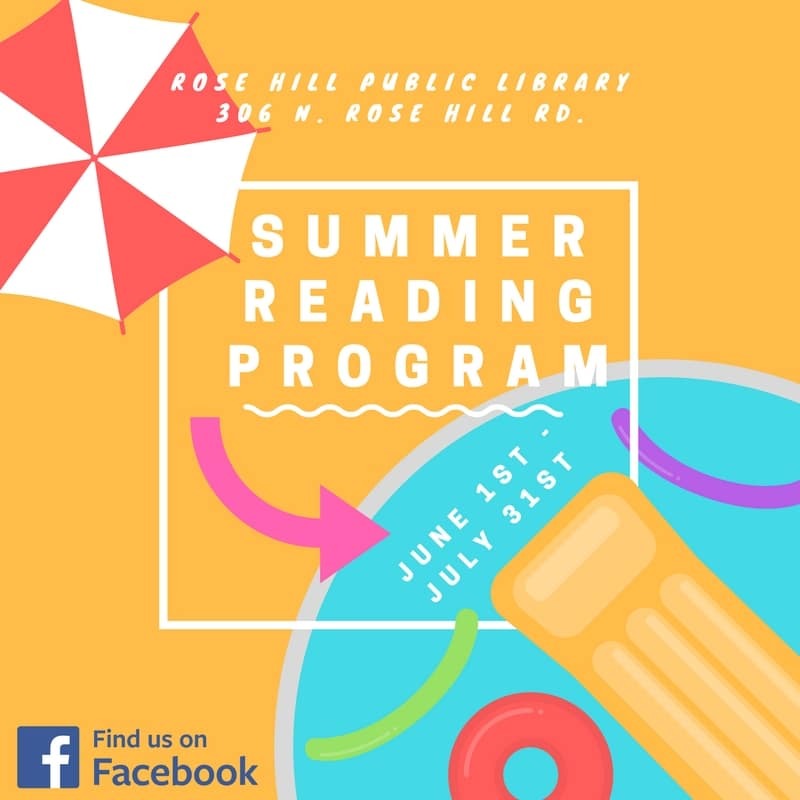 The 2018 Summer Reading Program has just a few weeks left. We’ve had so much fun reading, crafting, singing and dancing with everyone this summer! Thank you to everyone who participated this year! We got to hang out with Mr. Stinky Feet, the Clement McCrae Puppet Show, Mr. Kneel and his Hip Hop for Families Show and more! We will be giving out prizes for your reading logs through Saturday, August 11th. Have you seen our new sign? The library recently purchased a pole sign and we are so happy with how it looks in front of our building. 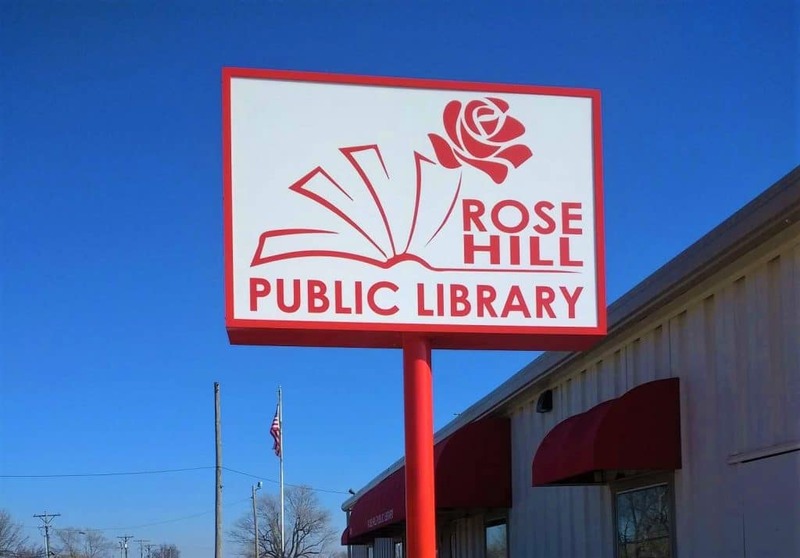 We find that many people don’t know that Rose Hill has a library or where we are located. We hope more people will see where we are located and use the library! We’re here to help in anyway we can! Meet Buddy the Rose Hill Veterinary Clinic dog! Buddy has a special story we wanted to share with you. Cindy Maxey, Rose Hill Public Library Director, found Buddy on the side of the road. He was injured. Cindy took Buddy to Dr. Harrison who promptly gave Buddy the medical care he needed. During his long and precarious recovery, one that he almost did not survive, Buddy stole the hearts of everyone at the Rose Hill Vet. 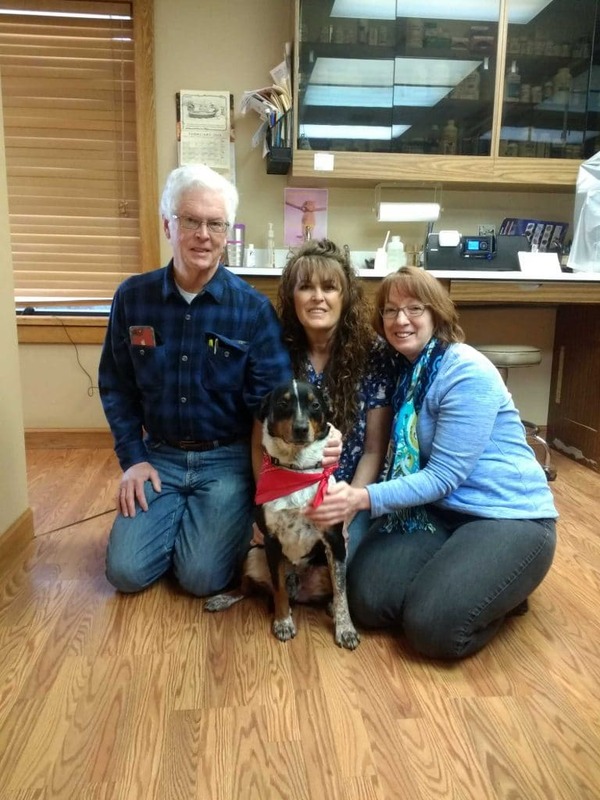 Dr. Harrison decided to make Buddy the official clinic dog and Mary Morrrow, who works the front desk, agreed to take Buddy home when the clinic was closed. These two Chamber member businesses gave Buddy a real rags to riches story. Needless to say Buddy’s life is not so ‘ruff’ anymore. 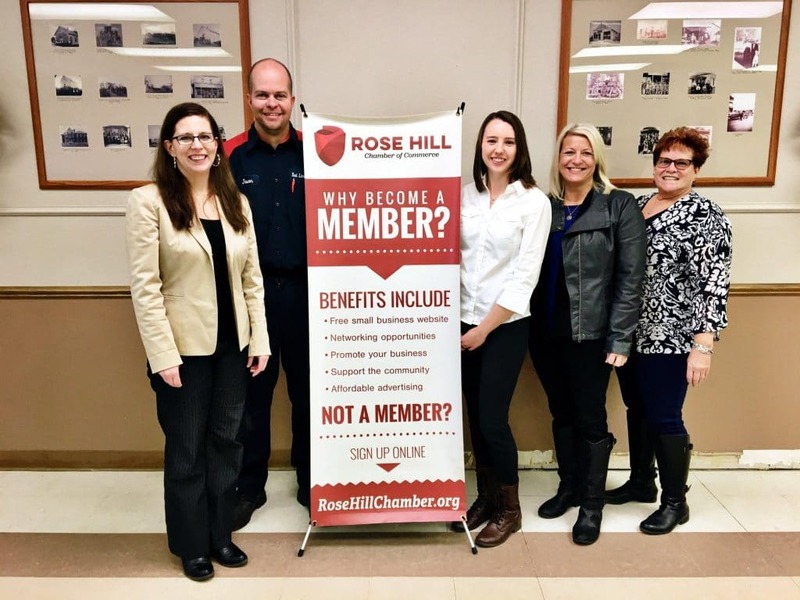 Staff member Christina Zenner was recently elected President of the Rose Hill Chamber of Commerce! Christina has been a board member on behalf of the Rose Hill Public Library and is excited to take on the new role as president. If you have questions about the Chamber contact Christina at czenner@cityofrosehill.com. Did you attend the Rose Hill Fall Festival? The event is a big part of our community and the library staff love to get involved every year. We hold a Fall Used Book Sale during Fall Festival every year and our very own staff member, Christina Zenner is on the Fall Festival Committee. As a Rose Hill Chamber Board Member she has coordinated the Chamber BBQ Contest during Fall Festival for 7 years now. 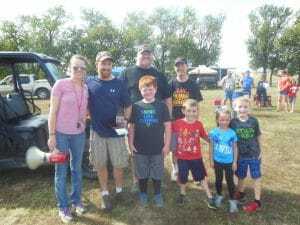 This year Christina added a People’s Choice Contest that took place at Shorty Cox Park where 130 people came by to taste test all the BBQ and vote for their favorite. Posted here is a picture of the overall grand champions, Smoking and the Bandits. The library is proud to take part in the Fall Festival every year and we hope you will look for ways to support the festival by participating in events or volunteering for an event! We love Rose Hill and want to encourage everyone to give back to their community by supporting this wonderful event each year. Our Book Bingo event this past Saturday was a success! We gave away so many cool prizes to each and every bingo winner. Everyone went home with something and some even left with multiple toys or books. The library collects book donations and toys from the Summer Reading Program to bring you these prizes! 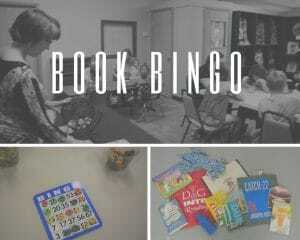 Once we have accumulated enough we host a Book Bingo event where all ages are welcome to come play bingo with us for an hour at the library. Bingo cards are handed out and to mark your spaces you get Fruit Loops, which is also a delicious snack while you bingo! We still have many prizes to give away at our next Book Bingo! Be sure to check back and take a look at our schedule of events for the next Book Bingo event! If you would like to be a part of our mailing list for upcoming events just stop in or give us a call at (316)776-3013. You’ll get emails about once or twice a month with upcoming events at the library! The 2017 Summer Reading Program is almost over! 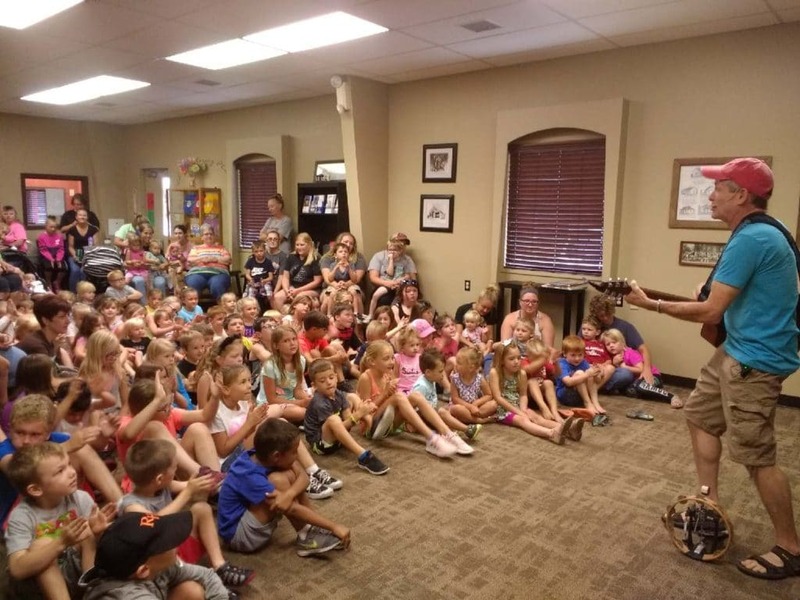 We have had so much fun at the library this summer. So many people attended our events and we are grateful to those who participated. The library invites special performers to perform at the Reading Program every year and this year we saw Mr. Kneel with his funky beat boxing, the Clement McCrae Puppet Show brought their poodles (skirts and all) and the Sugar Free Allstars sang about banana pudding and monster trucks with us. These events draw some of the biggest crowds we see all year.